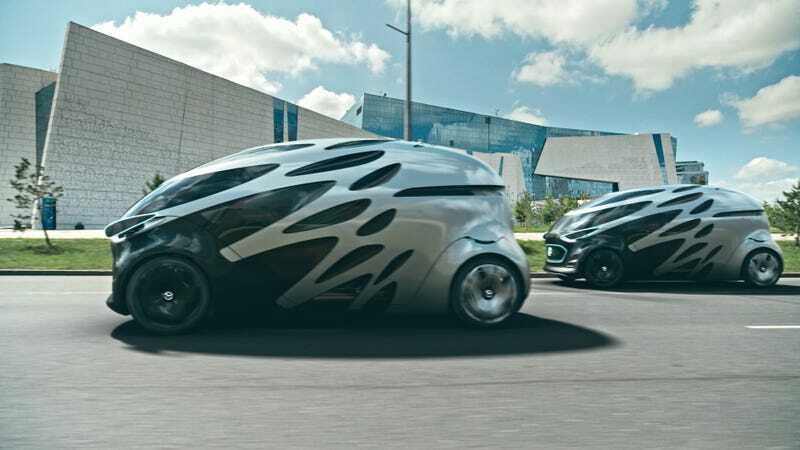 Self-driving autonomous concepts are all the rage these days, with Volvo introducing its 360c concept last week and Mercedes unveiling its own yesterday, while GM came out with their own phoned in version earlier this year. Laugh now, but this is going to be the solution to transportation problems for decades to come, regardless of whether they work or create new problems. In short: you think the federal, state and local governments of the United States are actually going to invest in public transit infrastructure? Hah. Haaaaah. The conversation surrounding the future of transportation has largely been a conversation between those arguing for mass transportation (“Ban cars!”), and those who want more highways and more roads, period, better to accommodate all the cars. The autonomous concepts present a third option, however. What if we kept the cars and kept the roads but got rid of the drivers, freeing up passengers to work, sleep, party, or commute long-distance? Consider, to take one example, how this might revolutionize short-distance domestic travel, like flights from New York to Washington, D.C., or from Los Angeles to San Francisco. Instead of commuting to the airport, which takes an hour; going through security, which takes about an hour; loading into the plane and waiting for takeoff, which takes more time; flying through the air in chair designed for small children; landing and deplaning; and, finally, driving to your final destination, which is probably not near the airport, you could order an all-electric, autonomous robo-taxi to your front door with an app, fall fast asleep, and wake up at the door of your destination. This has several benefits, not the least of which being that short domestic flights are also among the most inefficient and environmentally damaging, since planes expend a huge amount of fuel getting up to cruising altitude where the efficiencies of flying really come into play. But on short flights, planes get up to 40,000 feet only to almost immediately descend back down again. Is this realistic, though? The tech, for one thing, obviously has to catch up. So, too, does people’s perceptions of autonomous cars, since many remain skittish about even the idea of riding in a car controlled by a computer. But consider that just twenty years ago, fear of flying was prevalent enough to be a major plot point in a mainstream movie. There was some justification for that—commercial airlines were still relatively new for most people, since the golden age of flying (roughly the 1970s) was really only a golden age for the small few that could afford it. As flying got cheaper, more people began to fly, and more and more people became comfortable with the idea of sitting in a steel tube, ascending to 40,000 feet, getting up to speeds approaching 600 mph, all at the mercy of a human pilot. Compared to that, the idea of riding in an autonomous car—on the ground, at a tenth of the speeds of airplanes, with a computer at the controls and with numerous safety systems built in place—seems almost quaint. But an electric car would eliminate that, and an autonomous all-electric car would have the potential to broaden your options for living, since, for white-collar workers, you could spend your two hour commute working instead of driving. It also has the advantage of not having to require anymore infrastructure than what’s already in place. No new subway lines, no new train tracks, just the roads, and without the guilt of harming the environment. I should note that this whole argument is probably truest for America, where we lack the infrastructure and basic political will to invest in mass transportation. It was not always this way. The Federal Highway Aid Act, passed in 1956, allocated $26 billion for construction of the Interstate Highway system—about $270 billion in today’s money. Five years later, President John F. Kennedy signed the country’s first federal law which allocated money for urban mass transit projects—rail, electric trams, subways and so on. How much money? Just $25 million for grants, or 0.001 percent of what was authorized for roads. (An additional $50 million was made available for loans.) The Urban Mass Transportation Act, signed into law by President Lyndon B. Johnson in 1964, offered better terms, or $375 million in assistance to states and cities over three years, though that still paled in comparison to the highway money. Today, the disparity between highway funding and rail funding persists, with the Federal Highway Administration getting over $42.8 billion in funding in 2018, and the Federal Transit Administration, which doles out grants for mass transit projects, getting $12.3 billion, with an additional $1.8 billion going to the Federal Railroad Administration, which provides hundreds of millions in capital for passenger rail service. Knowing that, do you really believe governments will get wise and invest in infrastructure, or do you simply think they will wait for someone else to come along and solve the problem for them? Of course, if we had to start all over, we would have built a sophisticated rail network alongside President Dwight Eisenhower’s Interstate Highway System, but we’re stuck with what we have. Don’t worry, you’ll probably still be able to do sick burnouts in your now-classic 2017 Acura NSX on the weekends. Well, I think so, in any case.